After the highly informative Westminster Abbey tour, we decided to economize and out outside rather than pay extra to sit in. Unfortunately, we decided on the wrong park. Completely unbeknownst to us unwitting Americans, the British government is not content with simply extorting us at restuarants. Instead, they have decided to charge individuals for the “right” to sit in lawn chairs in the parks surrounding London. Though to be fair, we do not know if this is entirely true because this incident just occured at the wonderful St. James’ Park. While asthetically pleasing, the man walking around with a pence machine was very disconcerting. Being the crass Americans we are, instead of paying this man representing the greedy British government, we resevered our right to sit freely on the grass (despite his several attempts to swindle us). After suggesting that this incident reminded us of the rediciously “tea tax” placed on British imports to America in the 18th Century, we considered throwing our lawn chairs in the River Thames just to prove a point. Though after careful consideration and debate, we decided against this plan of action. 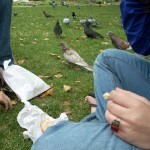 Instead, we rebelled by giving the local pigeon population the remains of our lunches. To our shock, we were unexpectedly surrounded but what seemed to be the entire pigeon population of London. Nevertheless, this did not deter us. Upon luring this savage creatures as close as possible and feeding them scrapes of bread, Amy decided to charge through the mass of beasts only to have one nearly miss Maddy and promoting the other people around us to duck for cover. With the pigeons well fed, the rebellion spread to some British children. We can only hope this incident will spark civil war among the park goers of London. These are just a few differences between the American and British way of life. Upon doing a little Google research, it turns out the chair-money collector was actually employed by whatever organization is in charge of the parks, and isn’t just some scam artist with a fancy “non-transferable” receipt printing machine on his waist. Our experience in the park as well as in restaurants has really highlighted some small but noticeable differences between British and American culture. Charging extra to sit in a restaurant as opposed to take-away (not take-out) actually makes sense when you think about it. Eateries have to pay bussers to clean tables, and with fewer tables to bus, they have less work for their employees. I’m sure it is just as shocking for Brits to go to America and pay the same price regardless of whether they get take-out (not take-away) or sit at a table. I’m wondering if a British person would be as willing to argue with the man trying to “sell” us our seats, or whether they would simply pay. I think their attention to being reserved and not causing a public ruckus would prevent them from acting as we did and sitting on the ground instead. It looked like the British found it just as ridiculous to be charged to pay for seats, considering when my group was in the park we saw not one person sitting in any of those chairs. Why would they not charge for the chairs? The chairs cost money, as does the upkeep of the park. The chairs also likely get vandalized. Charging for the privilege of the chairs seems like a sensible revenue stream to maintain the parks grandeur. Please edit the posts better. There are too many writing errors here.